Rather than waste everyone’s time, I’m going to attempt to keep this one short. I was overall very bored by this movie. I don’t know if it was the time of day I started watching it, the fact that I was already a bit tired after watching a movie before it, or maybe the story was as dry as the dessert the film took place, but I had to fight to stay awake to finish it. I’m willing to the give the movie a second chance someday, but it won’t be anytime soon. I remember reading reports of how this movie bombed in theaters when I thought it’d surely be a winner. 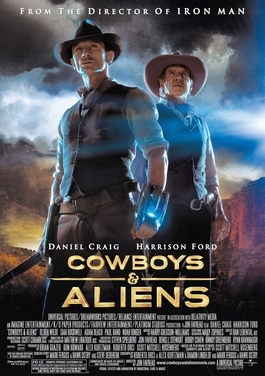 I mean c’mon, the title was intriguing: cowboys and aliens? Starring James Bond and Indiana Jones/Han Solo? What’s cooler than that?! Probably the actual graphic novel it’s based on, James Bond, Indiana Jones and Star Wars. Now that I think about it, you kinda got some of those elements in that movie. There’s spies, adventure, space… I don’t need to connect the dots for you, do I? I think my problem with the movie is it felt like it just wandered around trying to find itself while introducing me to characters I should care about. It had it’s heart in the right place, but we just didn’t have a good connection. I may have also been bummed out waiting for Daniel Craig to use his wrist gadget. Perhaps it’s my lack of enthusiasm about westerns. I mean I like them, but my list of favorite westerns is a short one. The shoot outs and special effects were cool, but I guess there wasn’t enough of them to keep me interested during the dramatic scenes. Even the secret of Olivia Wilde’s character wasn’t that big of a surprise. I have no problems with Jon Favreau’s other films. I’d like to see him do the 3rd Iron Man. Daniel Craig and Harrison Ford are still okay in my book. In fact, there was nothing wrong with the acting. I think it was just the pacing and the plot. I really don’t know what else to say about this movie other than it tried and it failed. At least it did for me as a viewer. This is one of those rare cases that the trailers and posters are better than the actual film itself.